Dual Fuel Heat Pump is a special application used in temperate countries where the outside temperature can go way below the freezing point. This system consists of a normal heat pump where cooling of the house can be achieved during summer and heating during winter. This is done by setting the mode to COOL during summer and HEAT during winter. 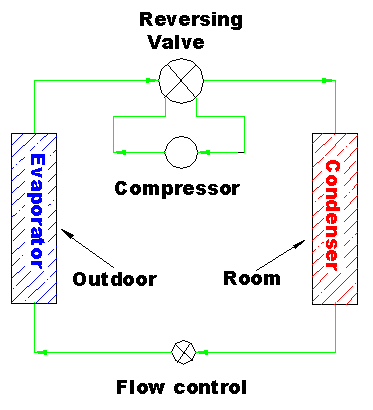 The heating for winter in heat pump is achieved by the use of a reversing valve which effectively change the evaporator to become condenser and the condenser to become evaporator. In this way, the heat is transferred from the outside of the house to the inside of the house by using the vapor compression system. The heat pump begins to lose its efficiency in transferring the heat when the outside temperature drops below 0°F. The COP or coefficient of performance may now become 1:1 meaning that the energy consumed by the heat pump to heat up the space is similar to as if an electric heater is used. Hence, there is no advantage of using the heat pump anymore at this temperature. The outdoor coil may freeze up and this will hamper the transfer of heat to the house as defrosting cycle will need to be activated. During defrosting cycle to melt the ice, the heat pump is actually running cooling cycle where heat from the indoor is transferred to the outdoor to get rid of the ice on the condenser. As a result, the occupants will not be able to get any heating if required during this cycle. In order to overcome the inefficiency of heat pump during low temperature, many manufacturers add an electric heater that will run concurrently with the heat pump to ensure that the occupants continue to get the necessary heating during defrosting. This heater is known as auxiliary heater. One other more cost effective way is to design in the oil or gas furnace that will be activated to run during the extreme winter condition. Hence Dual Fuel Heat Pump system is designed by manufacturers of HVAC where the oil or gas furnace is incorporated into the heat pump system. For instance, when the heat pump becomes inefficient when outdoor temperature drops below 32°F, the owner can switch the mode to gas furnace or the system may do it automatically using a certain criteria. When this is done, the heat pump will stop its operation. The compressor will not do anymore compression work. The gas furnace now takes over the heating of the house by the heating of the heat exchanger. Fan will blow over the heat exchanger and transferred the hot air to the room. Before you consider using the dual fuel heat pump system, it is always a good idea to do a calculation on the return of investment. As this is a more costly system compared to a normal heat pump, determine the typical number of days that you will be using the gas or oil furnace. Calculate the total gas bill that will be consumed during the extreme winter. Compared this to the cost as if you were to use an electric heater during the same number of days that you will be using the gas furnace. Do a simple calculation and if the return of investment on the savings is within 5-6 years, the system is worth investing on. Get an expert opinion on this if necessary. See the animated video of this system for greater understanding.